Burger 10 Sydney celebrates its third year anniversary with a Bang! 17 May 2017, Sydney, Australia – Burger 10 an award winning burger restaurant in Sydney is celebrating its third year anniversary on 31 May 2017 giving away free drinks of your choice for every main purchase. Save the date! We are giving away FREE DRINKS TO YOU on our 3rd Yr Bday Bash! YOUR choice of any Beers, Spirits or Non alcoholic beverages * (One FREE drink per 1 Main purchase). Valid all day on Wednesday 31st May 2017, for in store and takeaway purchases. Alcohol is served for diners only. Not valid with any other offer. “We are very pleased with how the community has embraced our restaurant during our three years in business,” said Executive Chef Hussein Jaber, Director of Burger 10. “When we open the restaurant we didn’t know what to expect, but our three years of operations has far exceeded our expectations, we have built solid relationship with our loyal customers and that we aim to grow and expand locally while we continuously keep our focus in revitalising our menu and offerings. On the 31st of May Burger 10 marks its third year anniversary and opening our door to everyone by giving away free drinks of your choice when you purchase any Mains, one free drink per one main purchase, it’s not that much but its our way of giving back to community and saying thank you for all the support,” concluded Hussein. Burger 10 menu consist of ten uniquely crafted burgers bringing the best flavours of ten different countries from around the globe and incorporating these flavours into 10 unforgettable burgers in Sydney. Author Sheryl JaberPosted on May 17, 2017 May 17, 2017 Tags anniversary, burger, burger10Leave a comment on Burger 10 Sydney celebrates its third year anniversary with a Bang! Perfect Lunch at Burger 10 restaurant too good to miss out! Looking for a perfect lunch? Here at Burger 10 restaurant we are offering $20 Meal for Two, unbelievable deal that is too good to miss out! Burger 10 recently awarded as 2016 City of Sydney Business of the Year and Outstanding Fast food and Takeaway by Inner West Local Business Awards is kicking off with a new way to save for Sydney siders. The new promotion offers the most exciting and unbelievable value for people in Sydney, Glebe and neighbouring areas. For limited time only, you can grab two (2) BURGERS* plus two (2) can of drinks and one (1) regular chips for just $20 that’s a massive savings of 37 per cent for a sumptuous gourmet burger. This special offer is available for a limited time only, kicking off on the 26th of September 2016 from Monday through Thursday, 12pm till 2:00pm. Applies to dine in & takeaway customers, conditions applies. Burger 10 also accepts reservations as well as walk-ins. For reservation please call (02) 8283 3878. Burger 10 menu items consist of ten uniquely crafted burgers bringing the best flavours of ten different countries from across the globe and incorporating these flavours into 10 unforgettable burgers in Sydney. We are a gourmet burger restaurant in Sydney that prides itself on providing customers with a unique burger tasting experience. There aren’t any other restaurants in Sydney where you can taste your way around different burgers of the world. At Burger 10 we offer unique signature burgers, handpicking famous ingredients of a country and creating that unforgettable burger tasting experience. 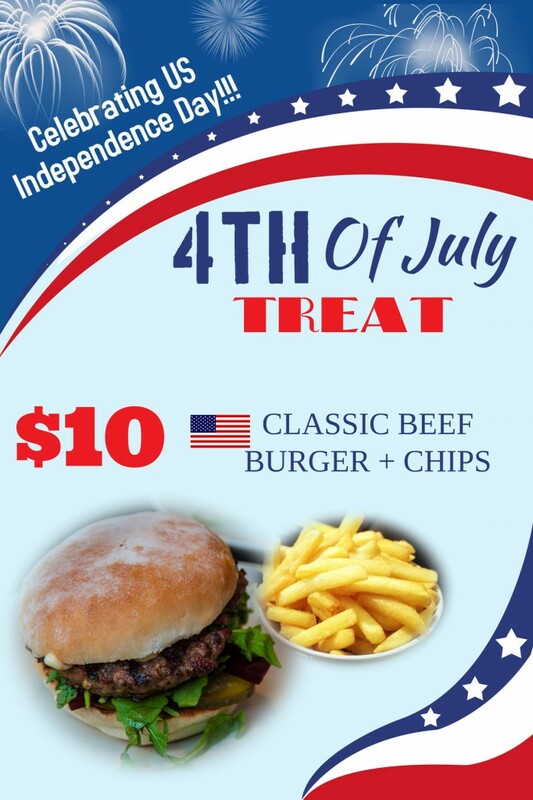 For more information contact us on email: info@burger10.com.au or call 02 8283 3878. Connect with Burger10 on Facebook, Twitter, Instagram or Google+. Author Sheryl JaberPosted on September 8, 2016 May 17, 2017 Tags burger, burger10, perfect lunchLeave a comment on Perfect Lunch at Burger 10 restaurant too good to miss out! Burger10 is celebrating its first year anniversary on 23rd April 2014. To celebrate this milestone, we will be unveilling our brand new celebrity menu and we are very excited to have Barnardos Ambassador, Tina Arena on board with Burger10 for this moments occasion. Tina has put her skills to the test and created 5 burgers which will feature on the Burger10 menu. Barnardos have been helping abused children for 130 years, so to support this cause Burger10 is donating $1 from each celebrity burger sold, to the charity. Aside from this, we will challenge two brave guests on the night to participate in our Burger10 challenge. This is where they will take to our stage, and attempt to down 10 burgers in one sitting, with a fairly generous prize rewarded to the winner. We would be delighted to have you attend our event and witness the unveilling of the brand new celebrity menu to the media, sample our celebrity created burgers, canapés and drinks. Make sure you RSVP if you haven’t already, looking forward to seeing you all. Who doesn’t love a good burger? And why not enjoy one with a beer! 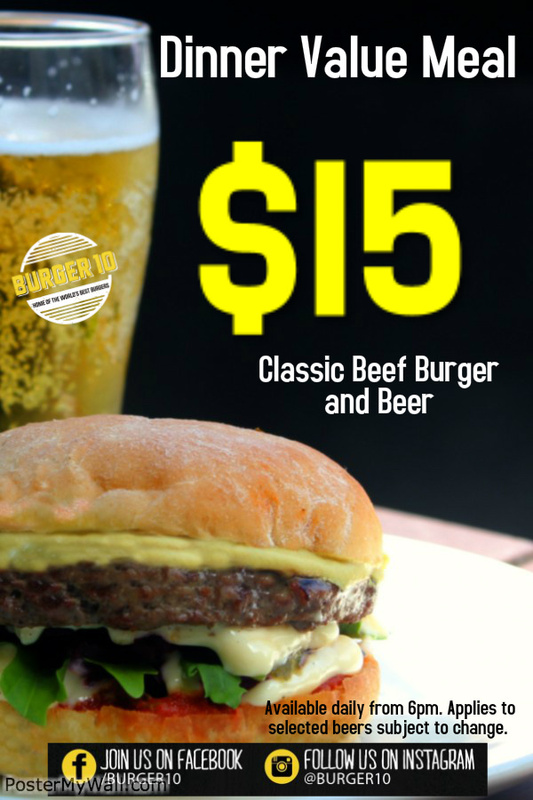 Try our new Dinner Value Meal for only $15 (Classic Beef Burger and Beer) available daily from 6pm. We all do it, some more than others, so why not take #myburger10selfie and show some #burger10 love! Three winners will receive $50 Burger10 Gift voucher! 1. Snap your most creative selfie with any of our 10 specialty gourmet burgers. 2. Follow @burger10 on Instagram or like our Facebook/burger10 page. 3. 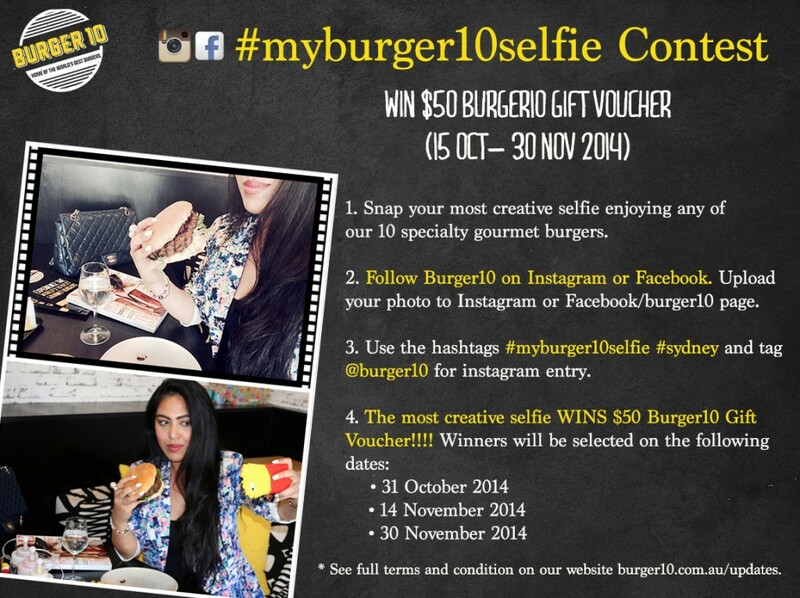 Upload your selfie on your Instagram or Burger10 facebook page. 4. Hashtag #myburger10selfie #sydney and share it with @burger10. 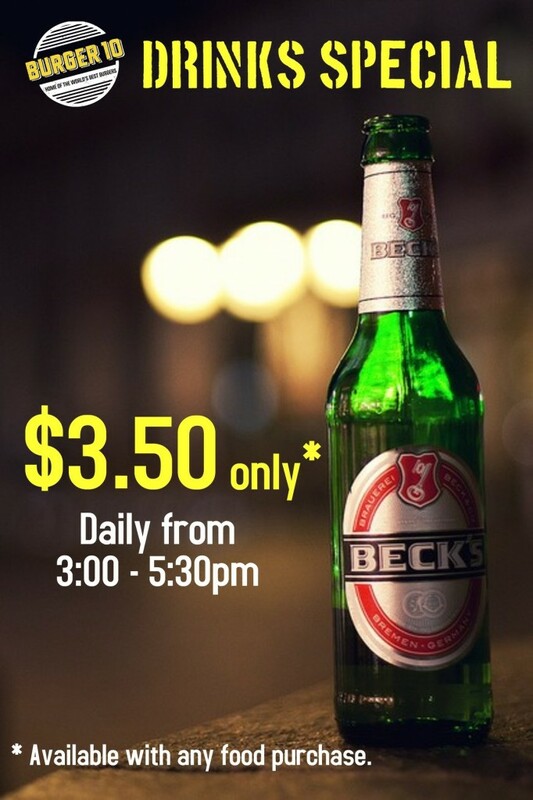 Come and Enjoy our Drinks Special, $3.50 Beck’s Beer available daily from 3:00pm – 5:30pm with any food purchase! Burger10 Celebrates Father’s Day with a great dining experience! 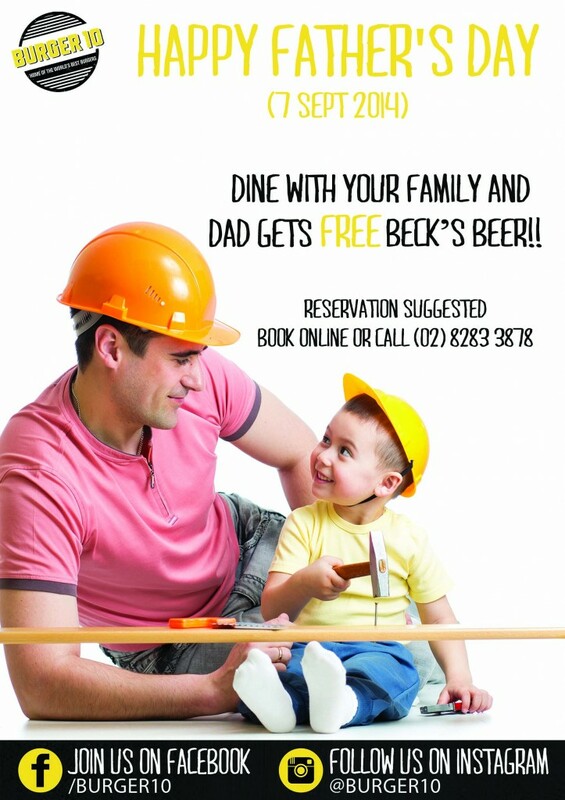 Celebrate a great Dad with a great dining experience! Bring Dad to Burger10 and enjoy our unique selection of gourmet burgers. ** DAD receive FREE Beck’s Beer for any purchase of our specialty burgers. Author Sheryl JaberPosted on August 30, 2014 August 26, 2016 Tags burger, burger10, father's day, sheryl jaberLeave a comment on Burger10 Celebrates Father’s Day with a great dining experience! News Alert!!! 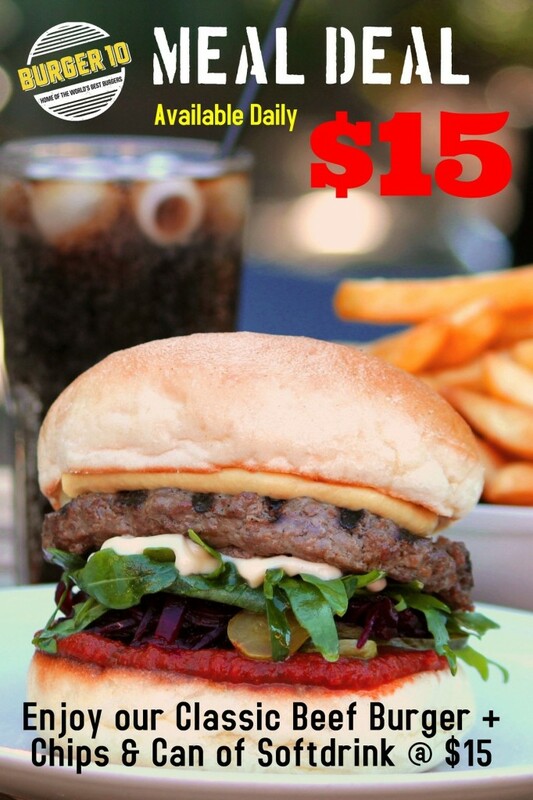 All #burger fanatic #burger10 is thrilled to announce its value meal deal all day everyday for $15 on our classic beef #burger with chips and can of soft drink! The Classic Beef Burger is one not to be missed, it is one of the best seller, made with classic burger bun, grass fed beef pattie, tomato chutney, beetroot, pickled cucumber, rocket leaves with Dijon mustard and mayo. Burger10 has also other perfectly designed specialty gourmet burgers on the menu and available on normal price. Burger10 specialises in creating unique gourmet burgers based around the unique flavours and ingredients of 10 amazing countries bringing that unforgettable burger tasting experience. In addition to the value meal offer, the specialty gourmet burger expert also offers Happy Hour promo providing the perfect opportunity to warm up this freezing winter. The offer includes $5 on selected wine and spirits available with any food purchase. Available 4pm – 7pm, Thu, Fri and Saturday. So hurry and grab your burger now!